If you have ever had a headache or shoulder pain from frequently turning to look over your shoulder while you are planting, mowing or harvesting, you may want to think about installing a camera and monitor system in your tractor. Chronic headaches and long-term injuries to your neck, shoulders and back can occur from frequently turning to look over your shoulder. Camera systems also make hitching up to equipment much easier and safer, you can position the camera to show the hitch, eliminating the need for a second person to guide you when hitching up equipment. Ohio AgrAbility has a few clients who use camera systems, a few of the farmers need the cameras because they have a disability that stops them from turning to look over their shoulder, and also makes it difficult to climb in and out of the tractor while hitching equipment. The cameras allow them to continue farming safely and independently. Other AgrAbility clients use the cameras because of the slow development of arthritis or other degenerative conditions over years of hard work. Depending on the type of work you are doing, you may wish to install a one, two or three camera system for your tractor. 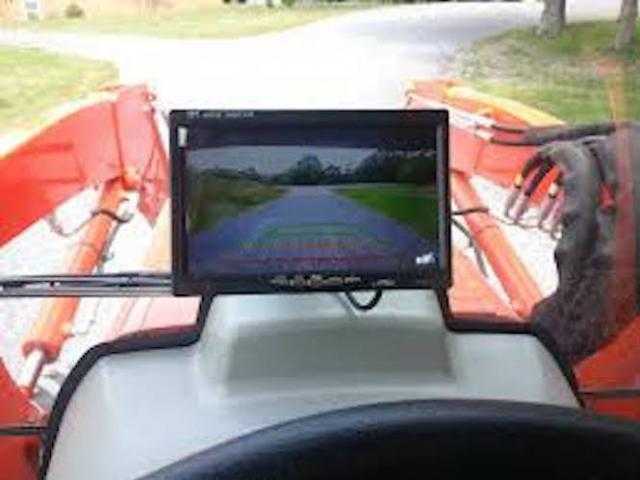 With any camera system, you will need one or more monitors mounted within easy line of sight in your tractor (typically monitors are mounted in front of the wheel, or near the top of the windshield in a tractor with a cab, wherever is easy to see, and does not obstruct your view.) When purchasing a camera system, consider the size of the monitor you want (5”, 7”, 10”), if you need a heavy duty or waterproof camera, those are available. Different cameras and monitors are linked in this article. Ohio AgrAbility and OSU Ag Safety do not receive any benefit from the links, and do not endorse any particular product or retailer. One -camera systems work well if you are just looking behind you to see the progress of mowing, planting or other work, and only need one point-of-view. The camera can be mounted on the rear of the fender, or behind the tractor seat. Two-camera systems are good if you want one camera to view where you are working, and another camera to help with hitching to equipment. You can use two monitors (one for each camera), or a monitor with a split screen, that would allow you to see both camera viewpoints at the same time. Three camera systems are helpful if you use the tractor for multiple tasks, and do not want to have to adjust the camera angle between tasks. The first camera would show the tractor hitch. The second camera would show equipment that was being used/towed and the third camera could show a higher viewpoint (a grain hopper filling, discharging grain into a grain cart or trailer). A split screen or quad view monitor could be used, or you could have multiple monitors if you don’t like looking at ta split screen. One of the missions of Ohio AgrAbility is to work with farmers with disabilities to identify ways to make changes or modifications to equipment, facilities or worksites to allow the farmer to continue farming. Another mission of Ohio AgrAbility is to offer resources and education to all farmers on how to reduce the risks of injury, and introduce modifications and technology that help farmers stay safe, and work more efficiently. Camera systems are great enhancements for any tractor, and serve a variety of farmers’ needs.